The Shun Pro Sho series focuses exclusively on single-edged and thus traditional Japanese blade shapes. Thanks to an extremely high standard of manufacture and material properties, the series is particularly suitable for continuous professional use. The elegant design of the knife combines classic Japanese styling with contemporary features in a masterly fashion. A visual highlight of the knives, they are elaborately decorated with an ornamental pattern in an innovative manufacturing process. The black pakkawood handle, with its simple, elegant shape, as in the shun classic series, is in marked functional contrast to the opulent blade pattern. Thanks to its form, the dark Pakka wood hilt of the Shun Pro Sho series is a true hand charmer. The blade of VG10 steel receives an ornamental tooling from an innovative etching technology. With its traditional, asymmetric Japanese blade shape the SHUN Pro Sho series complements the SHUN chef´s knife collection. Sanded on one side, the extraordinarily sharp knives run through the cutting good smoothly and precise, and fully meet the requirements of a professional cutting tool. 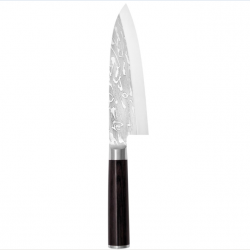 The top class series of Japanese chef’s knives is not only highly rated among Sushi chefs all over the world but also increasingly popular in European kitchens. The asymmetric blade with the one-sided hollow-ground on the opposing side delivers a unique cutting experience that cannot be matched by most European blades. The usuba, whose name literally means “thin blade,” is the traditional Japanese knife for cutting ve..